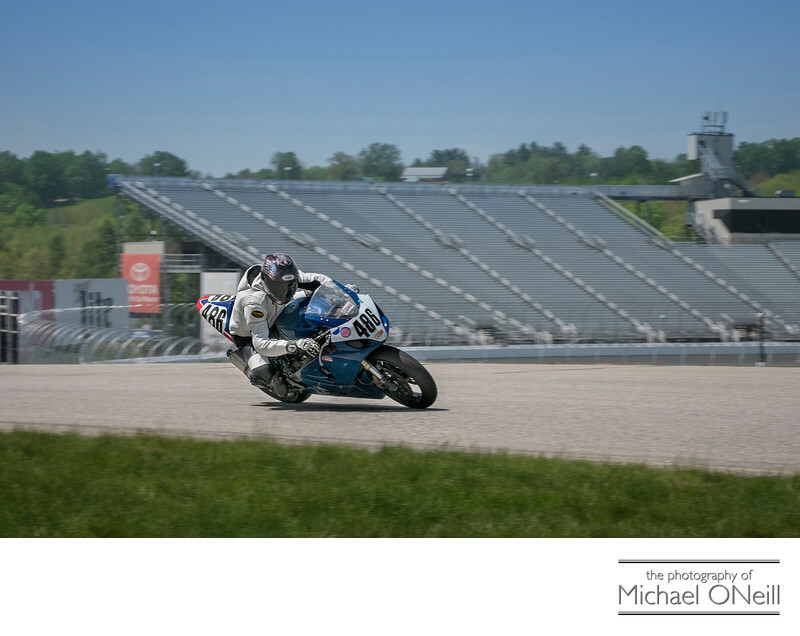 A great motion blur photograph of a racing motorcycle charging uphill out of turn 7 on the road course at New Hampshire Motor Speedway (NHMS). Capturing these incredible men and machines as they reach speeds of 150 MPH+ on this back straight is a joy. Road racing is my passion not just a specialty. I cover all sorts of speed contests as a contributing photographer to many major magazines and internet motorsports news web sites. Just this year alone I have covered two national events in the NHRA (National Hot Rod Association) Mello Yello Drag Racing Series: The New England Nationals in Epping, NH and The Summernationals at Raceway Park in Englishtown, NJ. I have also covered the Monster Energy Monster Jam event at The Nassau Coliseum in Uniondale, NY; a number of the Championship Cup Series races at NJMP (New Jersey Motorsports Park) and The Pirelli World Challenge (PWC) at Lime Rock Park in Connecticut…arguably one of the most beautiful road racing courses anywhere in the world. Upcoming events that I will be standing trackside at include the MotoAmerica Series race at New Jersey Motorsports Park and the IMSA WeatherTech series races at Lime Rock. All of these tracks are within a few hours drive of my Long Island, NY studio so I get called upon to shoot at them often. I am also available for assignment anywhere in the world for any type of motorsports event. If you are a magazine editor looking for a fresh set of eyes for your next race coverage article give me a call. If you are a race team in need of photography for public relations or sponsor solicitation give me a call. If you are a sponsor looking to document your on track activities give me a call. My background as a commercial portrait photographer brings another whole dimension to your race photography. I hope to collaborate with you soon.